Wingspan of 10 – 14 in. Budgies are monogomous. Partners show affection to each other by preening and feeding one another. Occupy a range of semi-arid and sub-humid habitats mainly in the interior of Australia. They sometimes can be found in dry grasslands of the southeast. Common budgies’ bodies are light green. Their mantles, which consist of their backs and wings, typically have yellow undulations and black markings.Adult budgies have yellow faces. Small purple patches are also found on their cheeks. 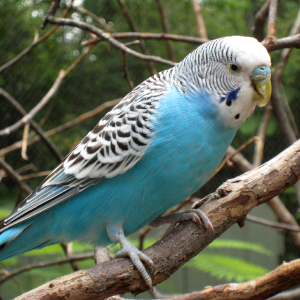 Until they get their adult plumage, immature budgies have black-colored stripes from their foreheads to their ceres or noses. Budgerigars make their nest in pre-existing cavities that are available in fence posts, logs, and Eucalyptus trees. Their activity, like most birds, begins just before sunrise with preening, singing, and movement within trees. Mating pairs show affection by preening each other's feathers. Photo by Josh Berglund (originally posted to Flickr as Up Close) [CC BY 2.0 (https://creativecommons.org/licenses/by/2.0)], via Wikimedia Commons. Photo has been cropped.